A leading full-service Marketing and Ad agency that specializes in developing marketing plans for auto dealerships. Champions the idea of a one-stop creative consortium. To debut with a new 20 x 20 at NADA (National Automobile Dealers Association). 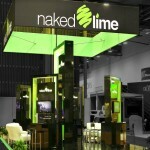 To create an unforgettable booth experience. To broadcast a contemporary look with sleek aesthetics. Designed a unique look for Naked Lime’s persona. Created a modern, electric environment. 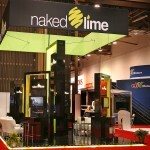 Produced a gloss black raised floor that was edge lit in the corporate lime color. 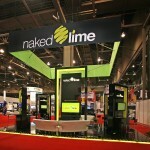 Provided neon green, backlit LED fabric perimeters and corporate ID tower. A bright oracle of personality that made immediate impact at NADA.